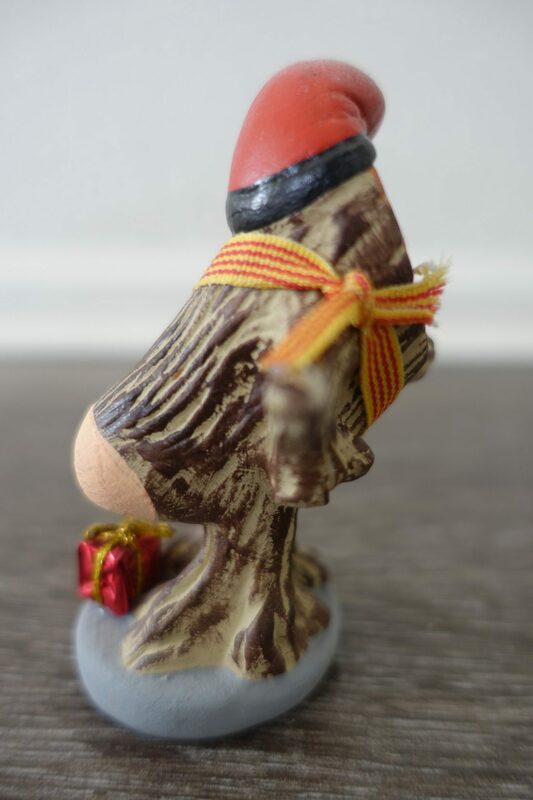 Just as the Caganer (Christmas Catalan ‘pooper’ figurine), Tio de Nadal (Christmas log) is another important character in Catalan Christmas traditions. Furthermore, both have one thing in common, they represent something people would avoid talking about: poop. However, this is one of the reasons that makes this figure as unique and special. Although in Catalonia some people celebrate Christmas like in the rest of Spain, others follow Catalan traditions. While some children wait anxiously for the arrival of Santa Claus with presents, others wait for Tio de Nadal to ‘poop’ their gifts. This ‘Catalan poop log’ brings joy and happiness to a lot of children. 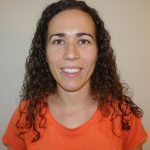 What is the Tio de Nadal? What does Tio de Nadal Represent? 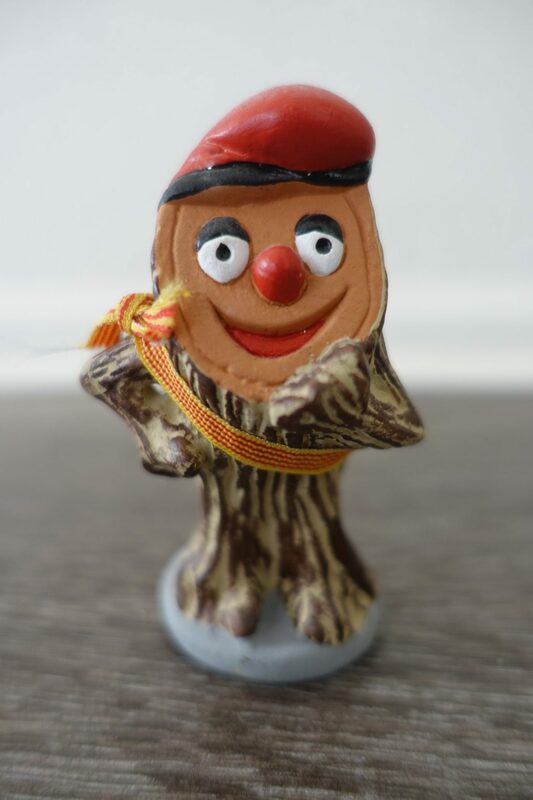 Tio de Nadal, also known as Caga Tio, is a log with a painted smiley face, that wears a Catalan hat called barretina, and is decorated with stick legs. Although the ‘poop log’ is particularly popular in Catalonia; Andorra and some regions of Aragon (Spain) also follow this Christmas tradition. However, in Aragon it is called La Tronca, Toza or Tizón de Nadal. Children ‘feed’ the log with sweets, candies, nuts and other type of food. The feeding starts on the 8th of December (which is the Feast of Immaculate Conception) and ends on the Christmas Eve (the 24th of December). To feed Caga Tio, children will place the food in the front of the log at night and in the morning, the food will have mysteriously disappeared and the log will grow over the following days. But of course, in reality, parents hide that food and replace the ‘poop log’ with bigger versions. Children will also cover the log with a blanket to keep it warm. In theory, the better the children treat the log, the better they will be rewarded. On Christmas day, or in some cases, on Christmas eve, children order it to defecate. They do so by hitting it with a stick, while singing the Caga Tio song (see below). Consequently, it “poops” presents. Normally, the parents cover the presents with a blanket behind the log. When a child hits the log, they will raise the blanket, pull a present and give the children the gift. Originally, they put the ‘pooping log’ by the fire, but this tradition is not as widespread anymore, because of the lack of fireplaces in the modern houses. Next, the log was burned and the ashes spread on the fields. However, nowadays parents keep the log for use the next year. Likewise, according to the tradition, the event finished by the log pooping a head of garlic, an onion, an egg, or any other symbolic item which is something not done as often now. In addition, in the old days, Caga Tio was only a dead log. Nowadays, they paint a face and make it look like an live person. Normally, the presents that Tio de Nadal “poops” are generally nougats, nuts, or candies, due to the tradition in Spain that the Three Wise Men are responsible for bringing the main presents on the 6th of January. Tio de Nadal has a rural and likely a pagan/pre-Christian origin. Caga Tio represents the log that burned as a source of heat and light in winter and symbolically everything they needed to celebrate the festivities (the sweets). The hits with a stick probably comes from stoking the Tio in the fire. However, the loss of fireplaces in modern houses, makes the hits with a stick to Caga Tio a symbolic act. Another theory according to an article published in 324 (a Catalan TV channel), proposes that the beating of Caga Tio comes from an old ritual to wake up nature on the day of winter solstice. The tradition nowadays, children get presents. As they state in 324, our ancestors would ‘eat’ the spiritual part of the food leaving the rest for family members, above all the children. In addition, the same article claims that the log was burned and the ashes spread on the fields which probably ensured a good harvest the following year. Also, over time, this tradition has become a children’s party and most of the original meaning has been lost. Traditions are always well known and followed by people in the countries they are from. However, sometimes traditions cross borders, spreading new customs across other regions. 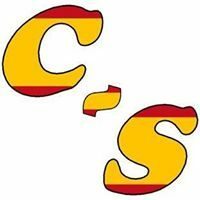 A clear example is the American comedian and actress Kate McKinnon, who explained on Late Night with Seth Myers that she adopted the Catalan ‘pooping log’ Christmas tradition. 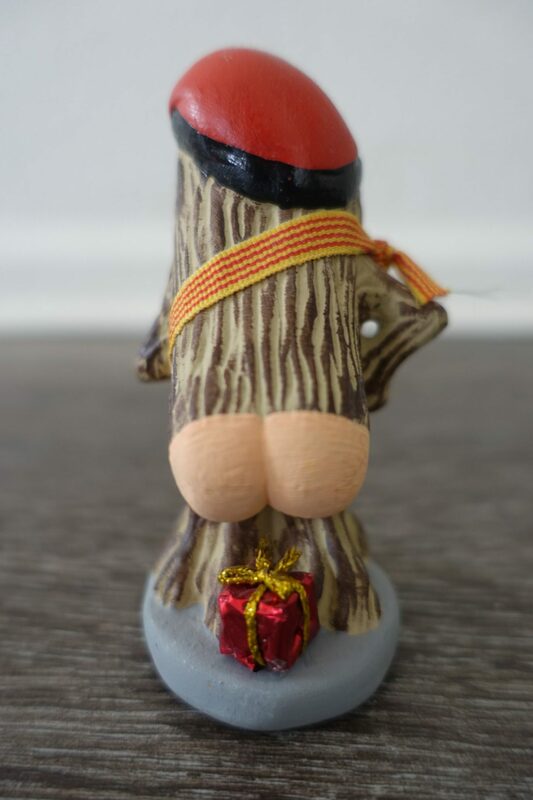 El Tio de Nadal has one thing in common with El Caganer: both represent the act of defecating. Therefore, why don’t we join these two awesome characters together to create the most awesome figurine ever seen? A Caga Tio caganer! Two figures in one. The way some Catalans celebrate Christmas is unique, but can also be disrespectful for some people. However, for those Catalans, it just part of the festivities. How can an act that normally is seen as gross for some, is as funny and normal for others? It seems culture may play a big role here. You grow up with and adopt the customs from the region you live in. This makes you see or do things considered “normal” in your culture. You are used to that and it becomes part of who you are. On the other hand, those same things you see as “normal” can be seen as all the opposite for others born and raised in a different part of the world. A related idea is the Mundari tribe in South Sudan which was featured in CNN. This tribe takes cow-urine showers because of their antibacterial properties and for aesthetic reasons. Most of you must think “how disgusting!”, but for them it is just a part of their culture, their everyday life. Is this really disgusting? Is this normal? It may depend on the person you ask. It may all be relative in the end.